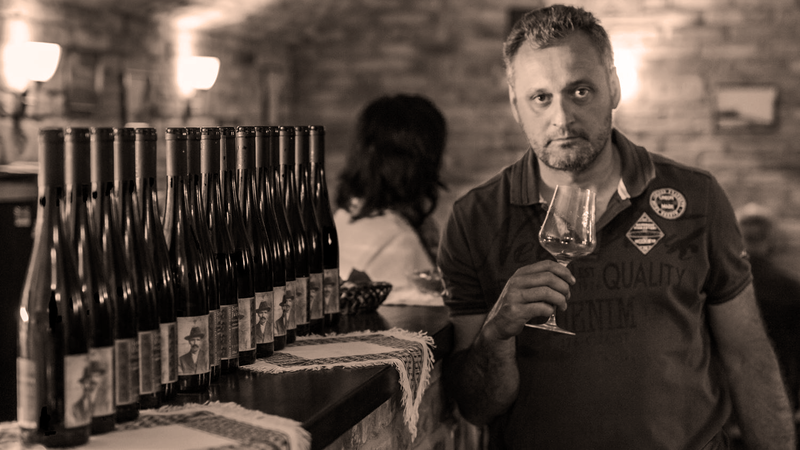 Karoly Kolonics is a fourth-generation winemaker in the small Hungarian appellation of Somló (pronounced shomlo). Somló is a volcanic hill, the uneroded core of an ancient sea-bed volcano, standing proud on the Pannonian Plain north of Lake Balaton, with unique basalt soils. Most growers here are weekenders, making wine for themselves, but Kolonics is entirely professional and Karoly’s passion for this area and its native grapes is second to none. He grows furmint, hárslevelu, olaszrizling and juhfark (pronounced you-fark) sustainably and with great skill across his bijou estate on the south side of the hill. Yields are restricted to ensure good fruit and winemaking is traditional in its use of indigenous yeasts and fermentation and ageing in both oak and acacia barrels. Dark gold. Creamy, honeyed fruit aromas. On the palate the honeyed fruit continues with the added complexity of beeswax notes and rich dried fruits. This luscious richness is counterbalanced by long salty lemon acidity and a firm mineral core. Very different from the 2014 – is this just vintage or a different winemaking style? Aromas of lees and yeast and ripe orchard fruit. On the palate lemon, lime and salty acidity backs the weight of ripe fruit. Similar in style to the 2015. Aromas of lees, yeast and creamy fruit. On the palate, concentrated, ripe, white-stone fruit is balanced by austere lemon, lime and salty acidity. Water-white with lime green flecks. This sis a variety with relatively neutral character and high acidity which allows the winemaker to demonstrate his skills. Here, Kolonics has chosen to show the power of the local volcanic soil. On the nose notes of fresh melon, lemon, honey and thyme are vibrant but delicate. On the palate the wine is bone dry, mineral, austere with a firm tight character. Lemony acidity, salty finish, this wine is still very young and needs time to open out to show its full charm. If you have to drink young, it is a palate cleanser for rich food. Pale water white colour. On the nose the characteristic lime flower character peeps through. On the palate, the volcanic soil once again shows its influence with firm steely, stony minerality and salty edge. The pretty charm of Hárslevelü gives a softer, almost riper hint of sweetness. Again, a wine with good ageing potential.